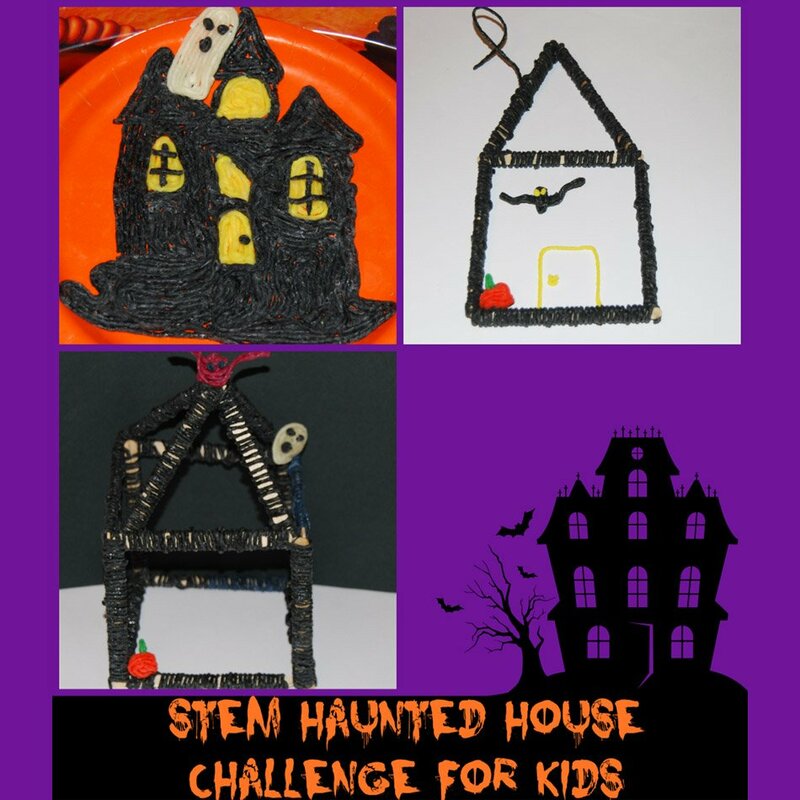 Welcome in October with a SPOOKY STEM haunted house challenge for kids! 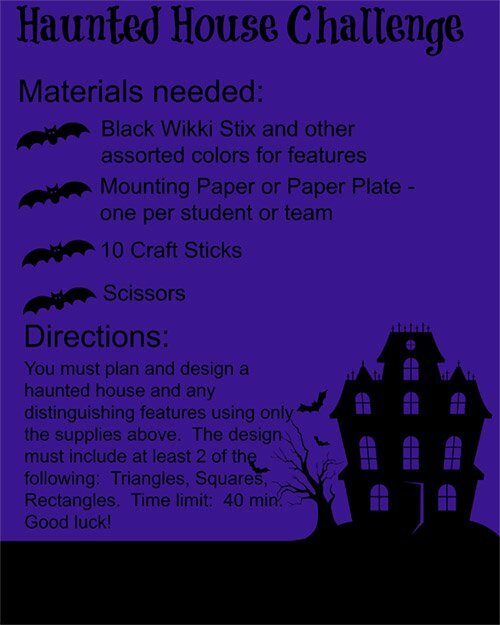 The haunted house building activity is a perfect seasonal opportunity for kids to use cross-disciplinary skills to gain new knowledge! STEM (Science, Technology, Engineering, and Math) activities compel kids to use inquiry and solution-based skills to garner tools they can apply to problems encountered in their everyday world. 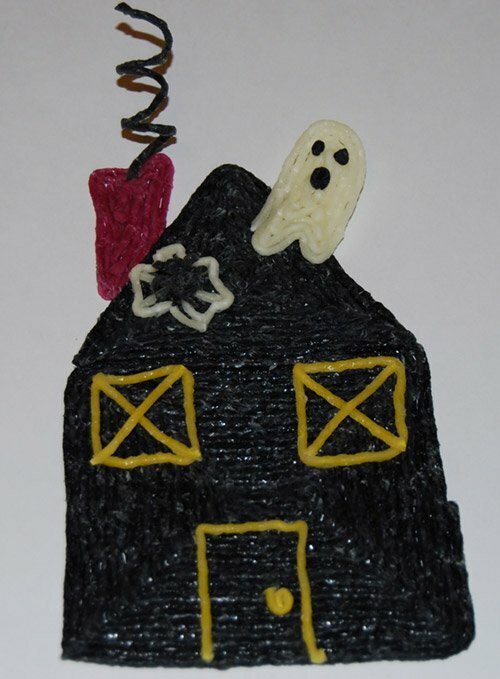 Gather your Wikki Stix and a few simple supplies to explore haunted house engineering with your own kids this fall! Tips for Parents and Teachers: STEM Challenges offer kids the opportunity to gain new knowledge using skills from various disciplines. By using STEPS to STEM SUCCESS (Ask It, Solve It, Plan It, Construct It, and Improve It), kids will learn to use important critical thinking skills to solve basic problems. 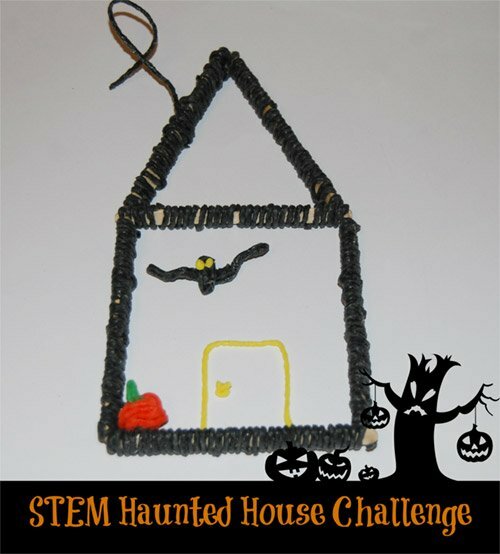 Encourage kids to consider each step as they plan and engineer the haunted houses. Try not to tell kids how to plan and construct, but provide guidance using open-ended questions to help them make decisions on their own. Science: Kids will use skills within the scientific method to solve the building challenge. 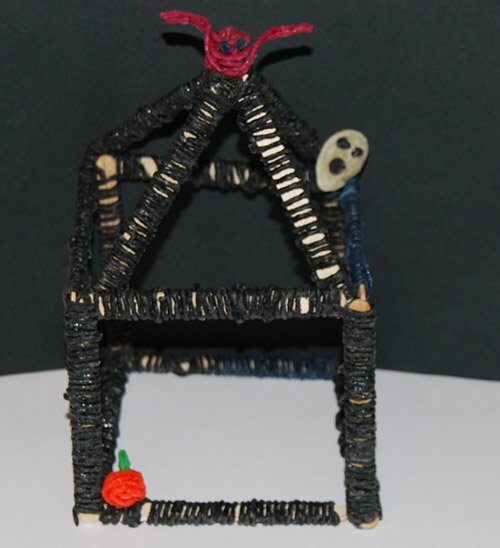 Technology: Kids will explore a haunted house video for inspiration in constructing various haunted house creatures. Kids will also use digital cameras to document the haunted house construction phases to incorporate into a seasonal class book. Engineering: Kids will plan and construct a haunted house using only allowed supplies. Math: Kids will explore geometric shapes, lines, patterns, and mathematical relationships as they construct the haunted houses. STEM HAUNTED HOUSE CHALLENGE for KIDS! The haunted house challenge can be completed individually or with a small group or team. If the kids are working in teams, remind them that they must brainstorm potential designs and evaluate all ideas before beginning the construction phase. One printable instructions file for each individual or team (print here). – download the pdf file haunted house directions and design diagram here. Kids must plan (verbally or by drawing their proposed design) and construct a haunted house using only the materials provided. The kids do not have to use ALL supplies, but they will be allowed no additional supplies. The haunted house design must have at least two of the following shapes: Triangle, Square, Oval, or a Rectangle. NOTE: For older kids (3rd grade-middle school) the challenge can be modified to include any polygon, a two-story house, or a haunted house that must be free-standing. Time limit is 40 minutes per team/individual. The simple square and triangle house was designed by a 2nd grade team. 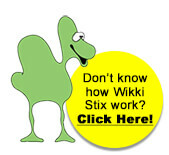 The kids wrapped Wikki Stix around the craft sticks so they would stay in place. 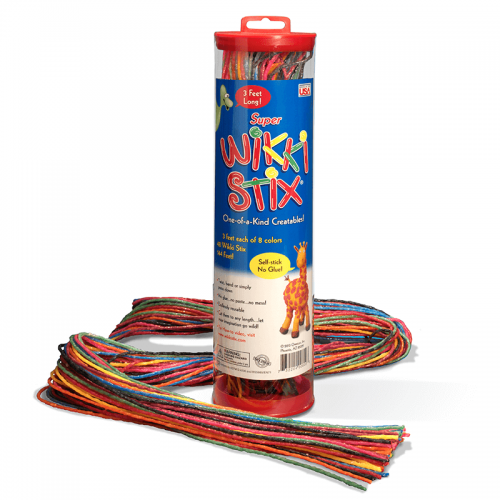 On the first try, the kids wrapped the center of the sticks, but found they needed Wikki Stix on the ends of the craft sticks to adhere each piece. The improved design worked better! The kids created a pumpkin, bat, and black smoke for the house. The haunted house construction above was a free-standing house built by a 4th grade partner team. 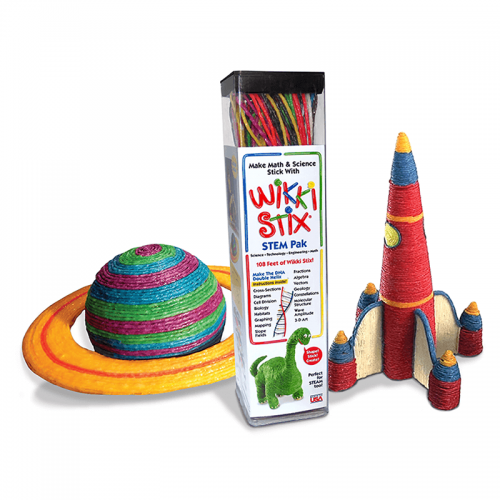 The team wrapped the craft sticks with Wikki Stix, but found they needed more pieces than they originally had planned for. The kids went back to improve the original design several times to fit the pieces together for a successful free-standing house. The haunted house above was constructed by a 4th grade partner team. 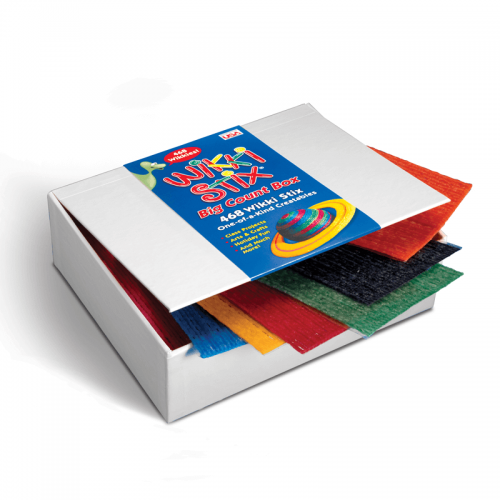 The team designed the house of all Wikki Stix. The windows, doors, spiderweb/spider, chimney, and ghost were drawn on paper and then created with Wikki Stix and pressed onto the constructed house. Note the use of window details to incorporate more triangles into the design. Digital Documentation of Learning: Invite the kids to use digital camera to take photos of the planning and construction phases. Print the photos with the final design pictures to create a seasonal class book for the kids to share with family and friends. The photos above were taken by students upon completion of the haunted house challenge. Wrap-Up: Give each student a copy of the Haunted House Response Sheet – please print here. (download the pdf file of the haunted house response sheet here) For younger children, go over the response questions together and have them verbally share. Older kids can complete the response questions independently and share as they are finished. The haunted house above was constructed by a 4th grade partner team.